On iPad, I‘ve imported a document from Photo to Designer in order to have a live effect layer for the perspective filter. 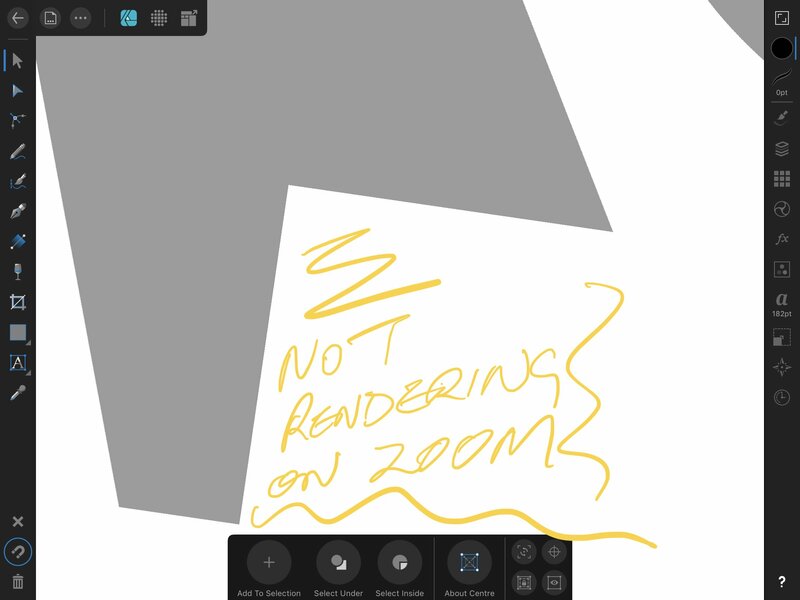 However, It renders not as expected: updates do not seem to happen until the canvas is moved and especially at higher zoom levels some parts are not rendered at all. To me, it seems like the renderer renders only a smaller area than it should. The issue exists for pixel layers, too, but seems less prominent. I hope this will get fixed, because I don‘t see any other way to create the kind of text shadow effect as shown in the video. Sure! Here is the file from the video, although it does not seem to depend on the specific file. To see the problem, for example just try zooming into the shadow. EDIT: I should also note that I did only observe the issue in Designer, while everything seems to work fine in Photo. Interesting, I had some issues with the perspective filter in Photo on Windows the other day. Basically upon merging down the filter it introduced some artefacts... I am preparing a video on the issue and will post ist soon. Seems to work fine in IOS12.1 beta 5, don’t see any problems as you show in video. What IOS version are you on,? Do you have lots of apps open? I'm running iOS 12.1 (at least I do now) on a 10.5" iPad Pro. I just tried closing all apps and rebooting my device, but problem still persists. All I need to do to get the glitchy behaviour is to zoom far enough into the shadow. Don’t want to annoy, but are there any news about this? Are the Devs aware of the bug?